"Can these two artists find love despite their pasts?" Travel to back to Happily Inc. , a unique town catering to weddings and love. Not just the brides and grooms, but the residents themselves. An established artist and a struggling artist come together to find that they're more alike than they realize. He's dealing with a revealed family secret. She's trying to move on from her called-off wedding. When a multi-day storm brings their feelings to the surface. She inspires him to find his way back into his art, family, and the world. He helps her realize that she can have the long-awaited career and a family she's been wanting. Natalie is a feisty paper artist working as an office manager at an art gallery, waiting for her big break in the art world. Ronan's family is full of artists including his famous father. He and his two brothers have moved to Happily Inc. because of a family secret that was revealed concerning him. Natalie is sent up the mountain to check on the reclusive Ronan and gets stranded by a major storm. They learn more about each other and their mutual attraction is acted on but, Natalie is upset that things don't go further and leaves as soon as the storm passes. Ronan is used to having her around and can't seem to stay away so he makes trips to town surprising everyone. Spending more time together, Natalie and Ronan support each other in their lives - she with helping him aid his family, and he with giving her advice about her art career. But when Ronan's dark past rears its ugly head, he goes back to his reclusive ways. Natalie is determined to show him there is light after so much darkness and pain, but will it be enough to convince him to stay with her? 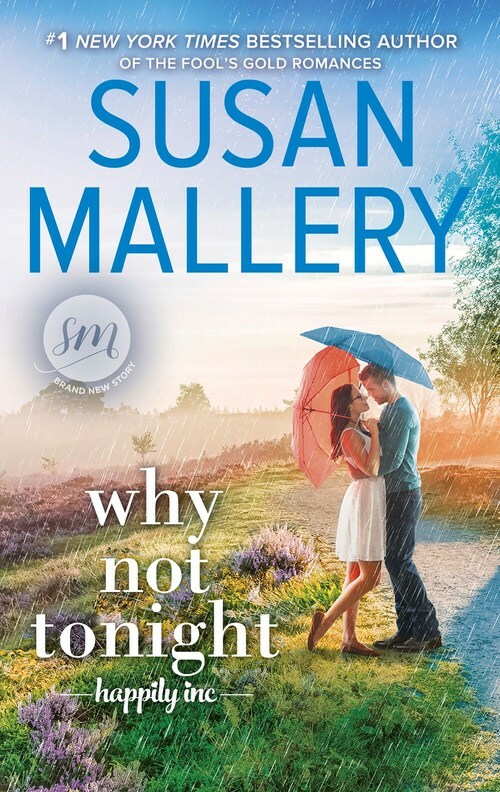 WHY NOT TONIGHT by Susan Mallery, the latest in her Happily Inc. series is indeed a happy set of stories. She's mixes humor, passion, and deep true love throughout her books. You can feel the emotion of her characters. You're on the edge of your seat on whether or not the main characters will get together and get past their emotional baggage to find and keep each other. Throw in an exotic animal and you'll have fun reading WHY NOT TONIGHT. If Ms. Mallery wasn't already a favorite of mine, she would be with this book. Please keep them coming! After a secret tore apart his family and made him question his sense of self, Ronan fled his hometown for Happily Inc, but the sunny small town can�t fix his damaged heart. He won�t give in to his attraction for beautiful, perpetually cheerful Natalie. She�s untouched by darkness� or so he thinks.